Happy Fasting (Ramadan month) ! | Ismurfshion. Ismurfshion. : Happy Fasting (Ramadan month) ! Happy Fasting (Ramadan month) ! Hi peps! It's been a long time since I didn't post my outfit (I will post my outfit on my next post btw) because this month is Ramadan, and during Ramadan all the Muslims celebrate it and have to fasting during this month and always do a prayer in congregation. So since I'm Muslim too yes I'm fasting too this month. I'm so happy every time Ramadan has come, it's a beautiful and most sacred month. Beside, we celebrate it by hanging out with the big family, forgiving each other (In Indonesia it's called sungkeman) and so many foods (we usually make ketupat with chicken braised in coconut milk, that's my fave!) when Eid Mubarak has come. Talking about Ramadan always make me think about new outfit, because there's such a tradition, we will buy a new outfit and wear it when Eid Mubarak, haha I know it's funny and this is not a necessary, but, mostly we buy a new clothes right? Lol :) Wheter it's a kaftans, maxi dress or new shoes, so, if you're looking for a new clothes for Lebaran (Eid Mubarak), you can find it on here. 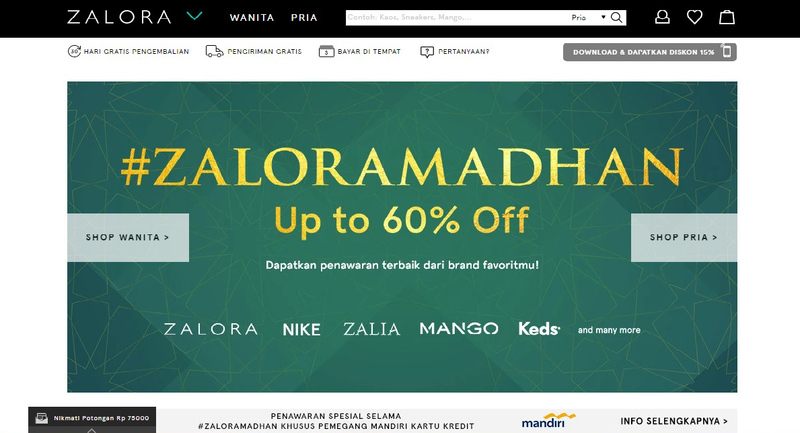 Zalora is one of my favorite online store, mostly I bought my shoes and bag on Zalora cuz they have a such a good quality and never disapoints me, so this month I will buy a new clothes for Lebaran on Zalora again since they sell so many item and so many discount up to 60% *droll* ok I can't wait to browse all the clothes ! You can browse it through an app on your phone if you're too lazy to open your PC, simply download the app on playstore or appstore and here we go, what are you waiting for? Happy Shopping! It's so amazing that you follow the traditions and enjoy Ramadan. I've read a lot on cultural diversity at https://www.getacademichelp.com/ but it's cool that I found your blog.